In The Second Machine Age MIT’s Erik Brynjolfsson and Andrew McAfee?two thinkers at the forefront of their field?reveal the forces driving the reinvention of our lives and our economy. As the full impact of digital technologies is felt, we will realize immense bounty in the form of dazzling personal technology, advanced infrastructure, and near-boundless access to the cultural items that enrich our lives. For most of us, the Industrial Age refers to the late 19th-century explosion of large companies with large factories that fundamentally changed the way we live and work. Yet, as authors Erik Brynjolfsson and Andrew McAfee explain in the opening pages of The Second Machine Age, their brilliant study of digital technologies, the Industrial Age was actually launched in 1775 — an era that for most Americans evokes colonial leaders with white wigs and tri-corned hats, not dirty factories belching dark smoke into the skies and thousands of smudge-faced children working dawn to dusk. What happened in 1775, of course, was James Watt’s invention (or, more accurately, the refinement) of the steam engine. The full impact of Watt’s steam engine on our society would not be felt until much later. 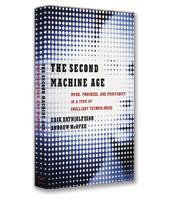 In a wide-ranging discussion of the joys and challenges of this “second machine age” — when, in the words of the authors, “computers and other digital advances are doing for mental power… what the steam engine and its descendants did for muscle power” — the authors give numerous examples of the opportunities created by digitization. A GPS-based app called Waze is one example. A standard GPS will give you the standard route to your office based on its downloaded maps. However, Waze sends back to the company’s servers information transmitted by sensors on the smart phones of its members already on the road; this information can then relay to the person about to leave for work that, for example, an accident has closed down the main road on his usual route. Waze is one illustration of how technological capabilities only now available can truly make life better. But the Industrial Revolution also brought serious, unacceptable consequences — widespread pollution and the scourge of child labor, to name just two, that a combination of democratic government and technological progress were able to overcome. The authors are convinced that the same combination of technology and the right policies can effectuate a similar result: a better life for all of us.